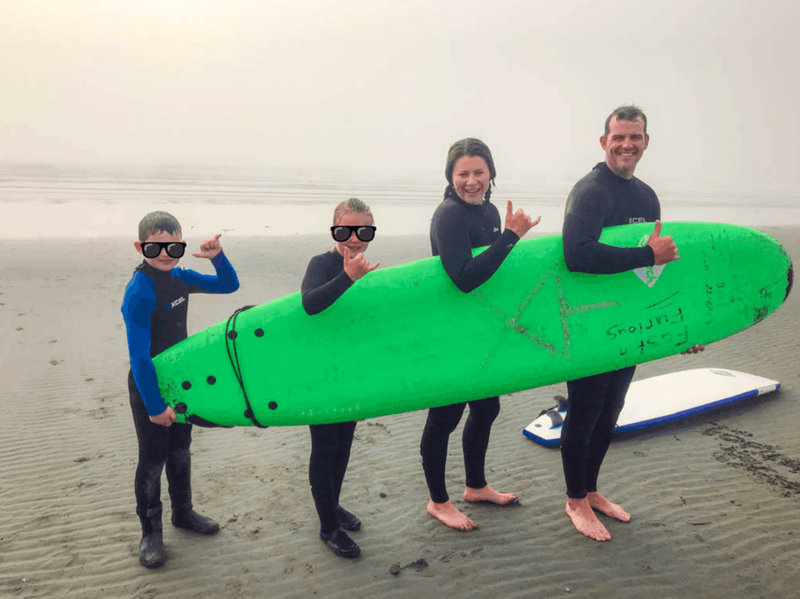 A Mom’s Recipe For A Perfect Day in Tofino by Jami Savage of adventureawaits.ca. Jami, who is a runner, snowboarder, hiker, volunteer, entrepreneur (and now surfer!) is the British Columbia-based mom behind adventureawaits.ca. 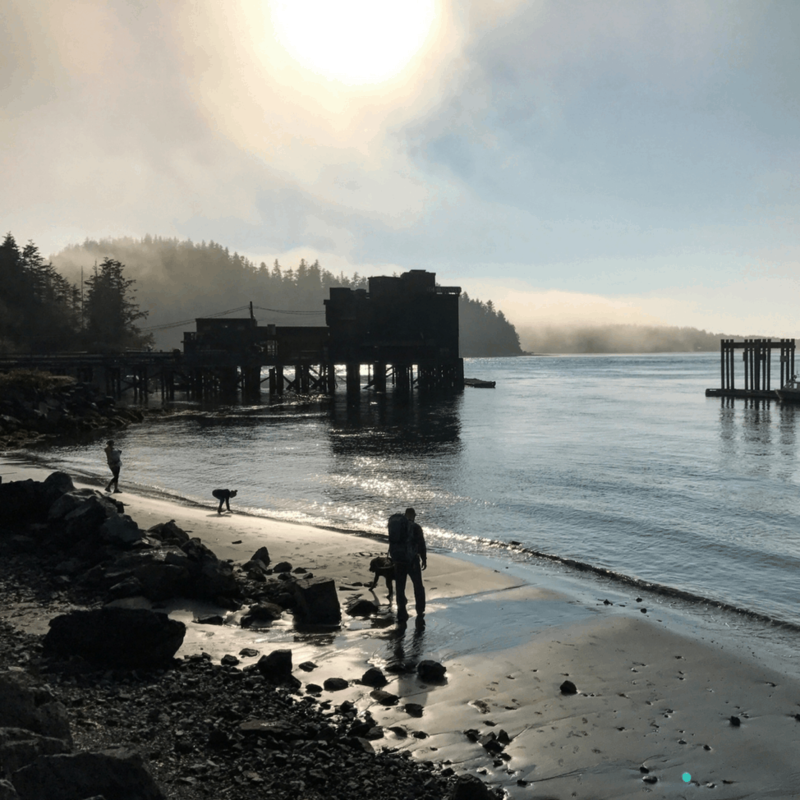 Follow her as she explores the great outdoors with her family and friends – and read her recipe for some Tofino outdoor fun. 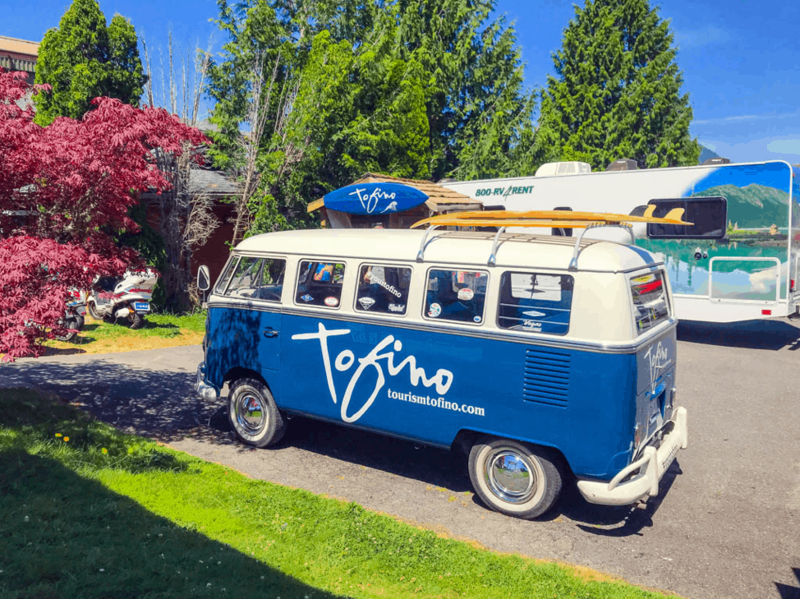 Are you a Mom who wants to get the most out of your time in Tofino? I’ve got an adventure filled recipe for you and your family! Get ready to gather your “ingredients” and get set for an amazing day. To start off the Ultimate Day in Tofino you need to get up early, as I’ve got loads planned for you! Set your alarm for 5 am and wake the kids slowly as you pack the final snacks into your lunch kit and head out for the day. 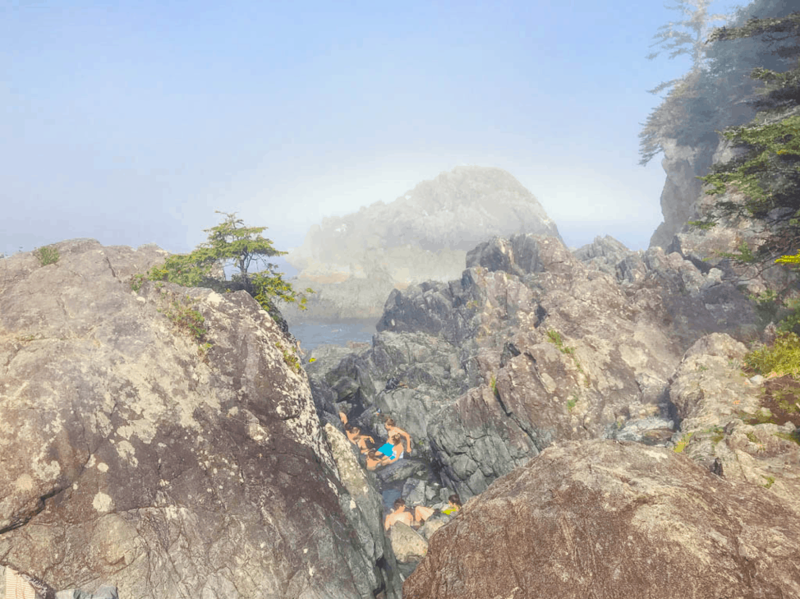 Soaking at Hot Springs Cove, 27 nautical miles northwest of Tofino. Photo by Jami Savage. After arriving at Maquinna Provincial Park, you’ll take an easy 30-minute stroll down a boardwalk through an old-growth forest. Have your camera out as the scenery is National Geographic-worthy and your family will be swooning about the size of the trees you’re wandering under. Next you’ll reach your destination; hot spring pools that overlook the ocean. Give the kids a quick snack and then sneak down through the rocks into the awaiting springs. 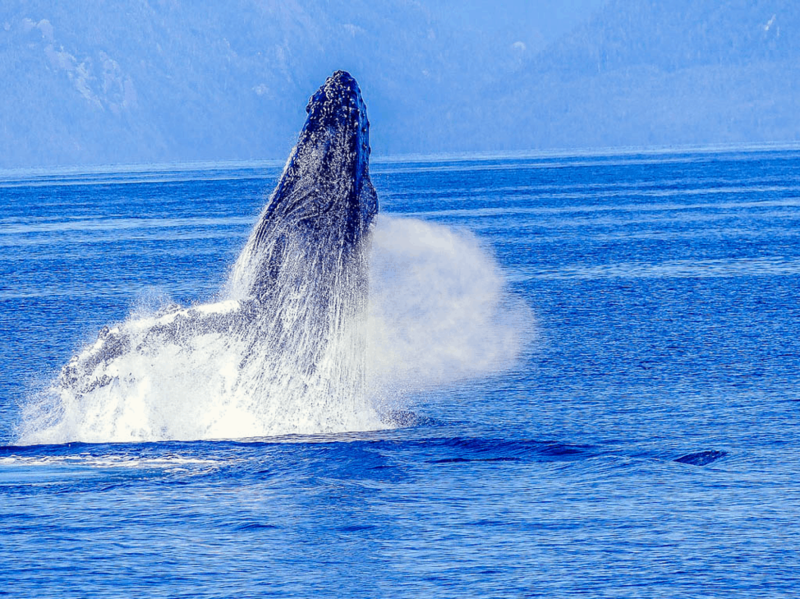 Now that you’ve had a morning of hiking and hot springs, it’s time to head back into town, but not before you meet up with a local Humpback Whale while he hunts for his lunch. 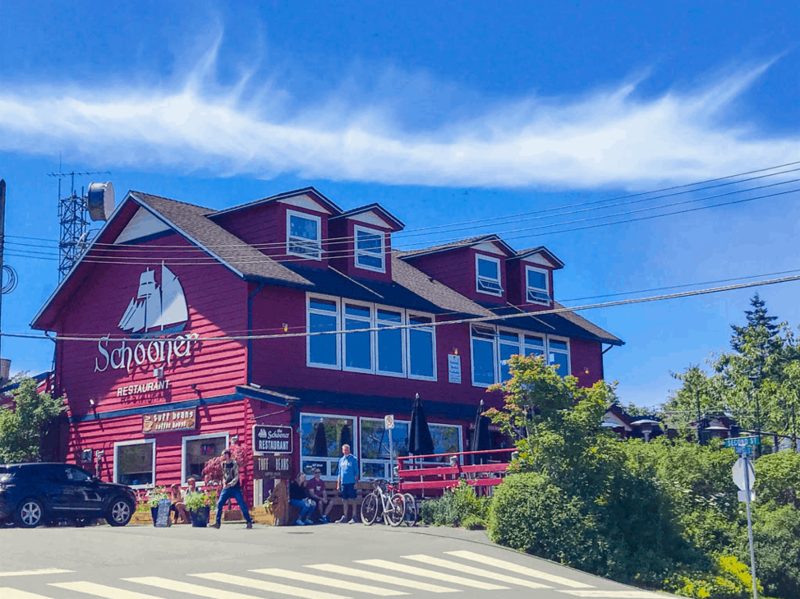 Schooner is one of Tofino’s oldest restaurants. Photo by Jami Savage . After saying goodbye to Ocean Outfitters, it’s time to hit the town of Tofino for some lunch. Load up on healthy food and carbs – you’re going to need them for your afternoon adventures! 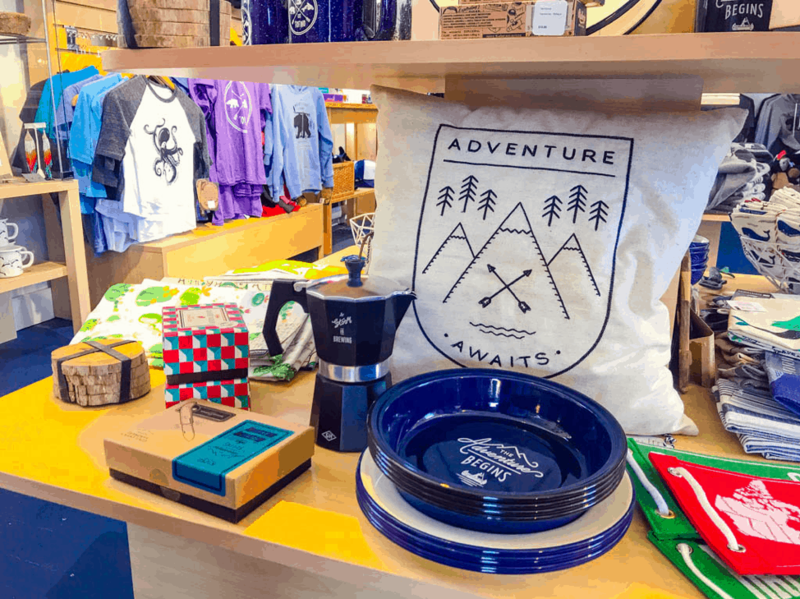 With a variety of independent, artisan-style shops and local goods on sale, the shopping in Tofino is perfect for those looking to pick up a keepsake or a special item for their wardrobe. Good times for all on the beach. Head down to Main Street and meet up with the crew at Tofino Surf School! 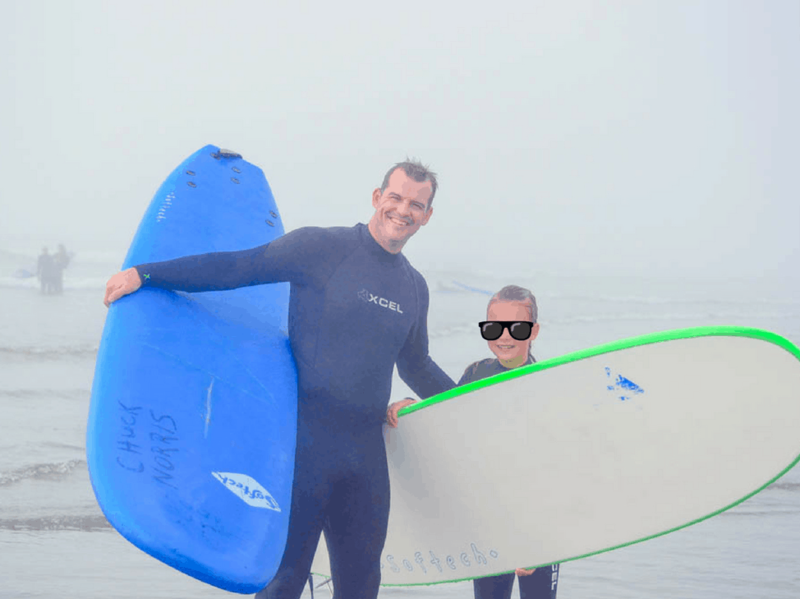 Assist your little ones (and adults too) as you collectively squeeze into wetsuits! While awkward at first, these are the essential way to stay warm as you take your family surf lessons. Next stop… the beach, where after some onshore training you’ll be ready to hit the waves and transfer from beginner to surfer in no time! Sit back and watch as the kids outshine the adults and pick up the sport quickly! Surf lessons in Tofino are generally 2.5 to 3 hours long. Most rental surfboards in Tofino have names. Look for them. Photo by Jami Savage . Lavish in the laughter and the memories your family is making! After your day on and in the ocean, you and your family will be spent! Grab a quick bite to eat from a local food truck or order in and head back to your accommodation for showers and well-deserved sleep!